Thomson's depiction of the territories of the Austrian Empire. 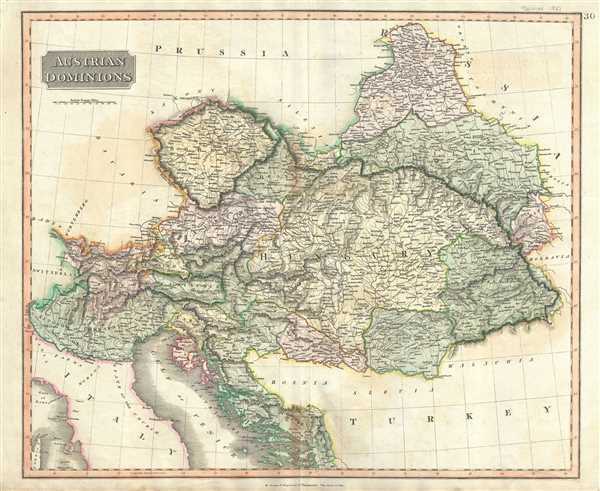 This is a beautiful map of the Austrian Empire by John Thomson dating to 1817. It covers the territories claimed by the once vast Austrian Empire, including in whole or part of the modern day nations of Austria, Slovakia, Hungary, Romania, Czech Republic, Poland, Ukraine, Serbia and Croatia. Thomson notes rivers, mountains, towns and other physical and political features. Founded in 1804 by the last Holy Roman Emperor, Francis II, the Austrian Empire lasted only till 1866 after which it became the Austro-Hungarian Empire. This map was prepared by John Thomson for inclusion in the 1817 edition of Thomson's New General Atlas. Very good. Minor wear and toning along original centerfold. Original platemark visible. Overall toning and foxing at places.